How do you know when a work of art was painted? Unfortunately there are no affordable direct methods for dating pigments, except in some cases as we will see later. Generally, for example, we can’t establish when a vermilion stroke was brushed onto a painting, but we can date most of the materials that the pigments are painted on. For instance, it is possible to date the wood support of a panel as well as canvas. The three most important dating techniques which are useful for the analysis of works of art are: Thermoluminescence (TL), Dendrochronology (DC), and Carbon 14 (C15). Thermoluminescence dating is used for pottery. It dates items between the years 300-10,000 BP (before present). Thermoluminescence dating is generally not very accurate. The accuracy of thermoluminescence dating is only about 15% for a single sample and 7 to 10% for a suite of samples in a single context. One way to pass a fake through a TL test is to expose the newly-made pottery to a high dose of artificial radiation sources, thus fooling the measurement instruments. However, producing fakes with this method calls for expertise on the subject, as well as expensive instruments. Instead, a less sophisticated method that would deceive TL testing is to reuse original broken and unmarketable pieces. 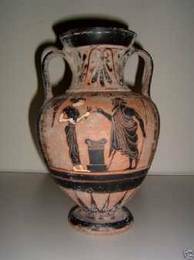 Forgers commonly use the bottom of an original broken vessel, which has no commercial value, and make a new fake vessel on top of it. The TL operator generally takes samples for dating from the bottom, avoiding damage to the image of the artwork. TL is based on the fact that almost all natural minerals are thermoluminescent. 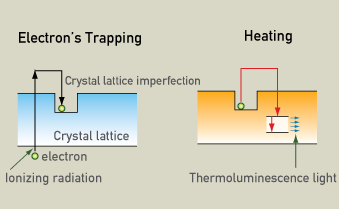 Energy absorbed from ionizing radiation frees electrons to move through the crystal lattice, some of which are trapped at imperfections in the crystal lattice. Later, heating releases the trapped electrons, producing light. Energy absorbed from ionizing radiation frees electrons to move through the crystal lattice, where some are trapped at imperfections. 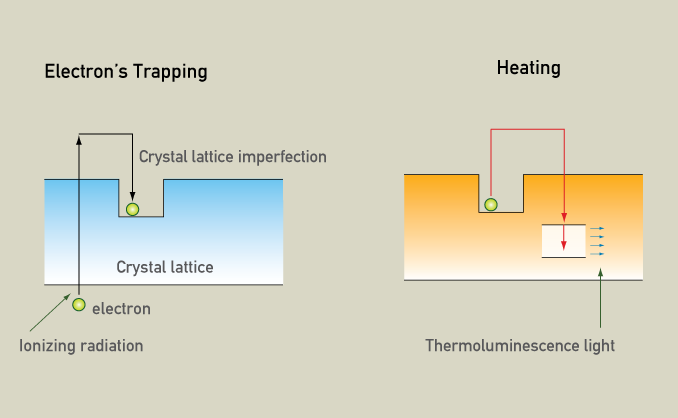 Later heating releases the trapped electrons, producing light whose intensity is proportional to the amount of radiation absorbed. Measuring the intensity of the luminescence can determine how much time has passed since the last time the object was heated. The light is proportional to the amount of radiation absorbed since the material was last heated. Natural radioactivity causes latent thermoluminescence to build up so the older an object is, the more light is produced. Therefore, thermoluminescence dating is actually determining the last time a crystal was heated and electrons were released. The minerals that are used for thermoluminescence dating are mainly quartz and feldspar. The last time a crystal was reheated and its electrons were released is known as a "clock resetting event". This usually occurs when the items are heated to 350 degrees Celsius. Therefore, in archaeology, thermoluminescence dating works best for ceramics, cooking hearths, incidentally fire-cracked rocks, and deliberately fire-treated rocks, such as flint or chert. Natural radioactivity causes the number of trapped electrons to build up. The older an object, the more trapped electrons it will have. When the object is heated to 350 degrees Celsius the trapped electrons are released and this is called a clock resetting event. From this time on, electrons start to build up again because of the natural radioactivity. When the sample is heated in the lab, it releases thermoluminescence light. 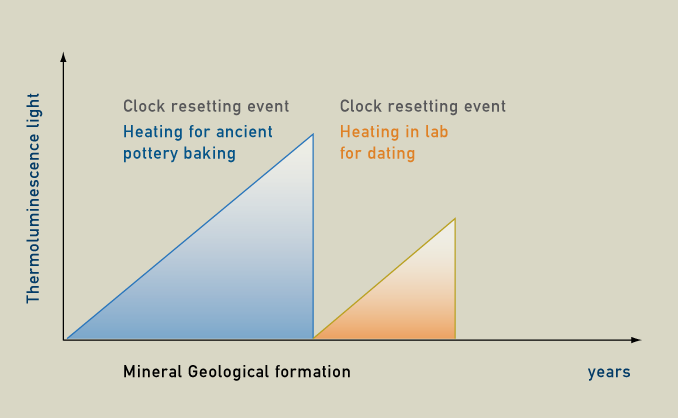 The intensity of the thermoluminescence light is proportional to the time that has passed from the last clock resetting event, which for ceramics correspond to when it was baked. When collecting samples for thermoluminescence dating, several samples from different vessels should be taken, not smaller than 1 gram. Samples should not be exposed to heat and powdery examples should not be exposed to bright light. A sample of the earth also needs to be collected so environmental radiation can be tested. The wetness of the soil and the sample should also be recorded. Samples should be placed in a polyethylene bag and sealed with electrical tape. Thermoluminescence dating can be performed only in a specialized laboratory which will have a chemical section for the treatment of the samples with reagents and a radiation hazard restricted area. 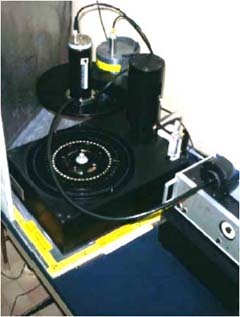 Indeed, the figure shows an automatic instrumentation which allows measurement of thermoluminescence light from samples and also the determination of the dose rate per year. This last procedure involves the use of a radioactive source, though very weak. Automatic instrumentation which allows measurement of thermoluminescence light from samples and also determines the dose rate per year. The word Dendrochronology comes from dendros (which means trees). 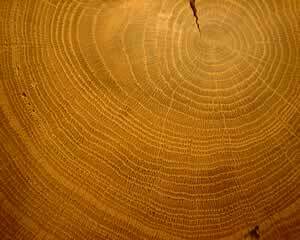 Dendochronology is the scientific method of dating wood based on the analysis of tree-ring patterns. In many types of wood, Dendrochronology can date the time at which tree rings were formed, down to the exact calendar year. In some areas of the world, it is possible to date wood back a few thousand years, or even several thousand. In most areas, however, wood can only be dated back several hundred years, if at all. 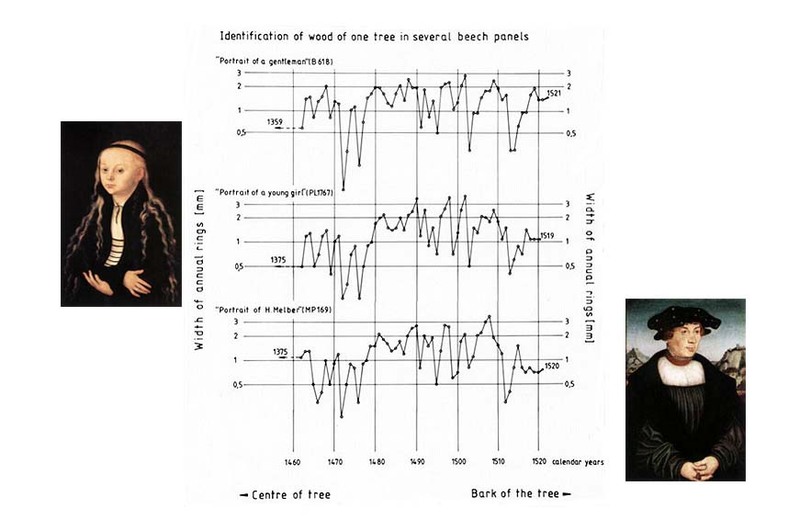 Dendrochronology has become important to art historians in the dating of panel paintings, and can also provide information as to the source of the panel. 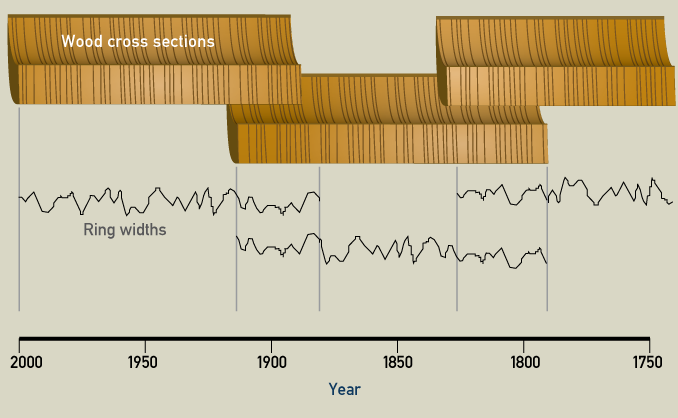 Dendrochronology can help to date a panel by analysing the pattern of tree rings within a plank to determine the calendar period during which the tree grew. Therefore dendrochronology is used successfully for authentication purposes, to establish if a panel is as old as it is purported to be. Sometimes dendochronology can also be used for confirmation and finer dating of art works. Take three Cranack the Elder portraits Portrait of a gentleman, Portrait of a young girl and Portrait of H. Melber. The first is signed 1528, therefore we just need to confirm this date. The second is just attributed to 1520 based on stylistic details. The third is signed 1526, but needs confirmation. The first thing to do is overlap and compare the rings patterns of the three panels. You can see clearly that all the tree piece of wood come from the same geographical region and belong to the same historical period. This is a useful information for the authentication of the art works - at least, of their panels. But there is even more information that you can extract from these graphs. The last ring of the second portrait panel dates back to 1519 and we know that generally, a period of 6-7 years was necessary for the wood panel to be ready to be used for panel painting. Therefore the attribution of the second painting to 1520 should be revised to 1525-1526. Dendrochronology was discovered by A.E. 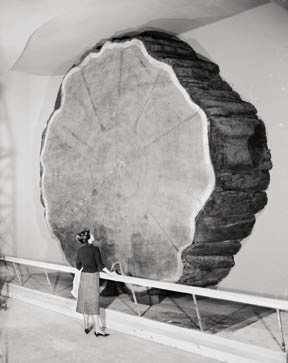 Douglass from the University of Arizona, who noted that certain species of trees produced wide rings during wet years and, inversely, narrow rings during dry seasons. Each year, a tree adds a layer of wood to its trunk and branches, thus creating the annual rings we see when viewing a cross section. New wood grows from the layer between the old wood and the bark. In the spring, when moisture is plentiful, the tree produces new growth cells. These first new cells are large, but as the summer progresses their size decreases until, in the fall, growth stops and cells die, with no new growth until the next spring. The climatic changes or patterns in specific geographic areas can be traced by the study of old living trees. Samples taken from trees of unknown age can then be studied for matches with samples from trees with known sequences of growth. Using this process, when the rings "match" or are found to be overlapping in age, we are able to "see" even further back in time. 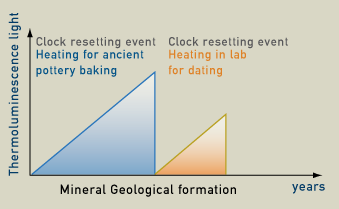 A chronology (arrangement of events in time) can be made by comparing different samples. Let’s say the sample was taken from a standing 4,000 year-old (but long dead) oak tree. Its outer growth rings were compared with the inner rings of a living tree. If a pattern of individual ring widths in the two samples prove to be identical at some point, we can carry dating further into the past. With this method of matching overlapping patterns found in different wood samples, oak tree chronologies can be established into the past for a specific region. Three pieces of wood are used to establish a dendrochronology for their region. The first tree was cut down in 2000, and it is possible to count backwards to 1870. The second piece of wood shows an overlap for the years 1870-1910: both trees have the same pattern of thick and thin annual rings. The third piece of wood shows an overlap with the second one. 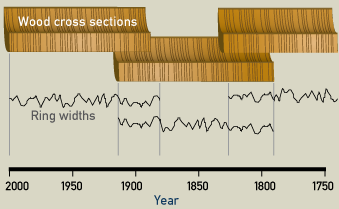 Therefore it is now possible to date any piece of wood grown between 2000 and 1750. A beautiful giant sequoia cross section. You probably have seen or read news stories about fascinating ancient artifacts: At an archaeological dig, a piece of wooden tool is unearthed and the archaeologist finds it to be 5,000 years old. A child mummy is found high in the Andes and the archaeologist says the child lived more than 2,000 years ago. How do scientists know how old an object or human remains are? What methods do they use and how do these methods work? The method is carbon-14 dating and it allow determining the age of certain archeological artifacts of a biological origin (bone, cloth, wood and plant fibers) up to about 50,000 years old. In order to date cave paintings archaeologists rely on indirect evidence which means, for example, that they will date organic materials found in the cave (bones and burnt woods) with radiocarbon. Is it possible to directly date pigments containing organic carbon, such as carbon black? On the left you see burnt wood, the source of carbon black. Burnt wood such as this was used to create the images on the right - rock paintings made with abundant carbon black. It is possible to directly date these organic carbon black pigments, due to a rather long process that aims to separate a sample’s inorganic carbon coming from the limestone support (calcium carbonate, CaCO3, not useful for dating) from the pigment’s organic carbon component. This method allows dating back to thousands of years with an error of just one century. Compare it with indirect methods, generally used by archaeologists, which give errors in the order of thousands of years! This is the method: take a sample of black cave paint, scrape its carbon black powder from the limestone and place the powder in vacuum to let atmospheric carbon dioxide (CO2) evaporate away. 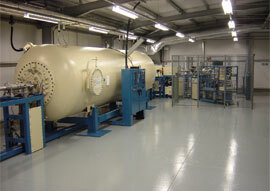 Next, swamp the sample with an oxygen plasma that converts the sample’s organic carbon into carbon dioxide. Collect this date-bearing gas, now free of contamination by inorganic carbon, and analyze it by accelerator mass spectrometry in order to evaluate the ratio C12/C14. Cosmic rays enter the earth’s atmosphere in large numbers every day. For example, every person is hit by about half a million cosmic rays every hour. It is not uncommon for a cosmic ray to collide with an atom in the atmosphere, creating a secondary cosmic ray in the form of an energetic neutron, and for these energetic neutrons to collide with nitrogen atoms. When the neutron collides, a nitrogen-14 (seven protons, seven neutrons) atom turns into a carbon-14 atom (six protons, eight neutrons) and a hydrogen atom (one proton, zero neutrons). Carbon-14 is radioactive, with a half-life of about 5,700 years. Every radioactive element has a different half-life, ranging from fractions of a second to millions of years, depending on the specific isotope. For carbon-14, it is known that half of the atoms decay in 5700 years. Therefore, 5700 years is the half-life of carbon-14. The carbon-14 atoms that cosmic rays create combine with oxygen to form carbon dioxide (CO2), which plants absorb naturally and incorporate into plant fibers by photosynthesis. 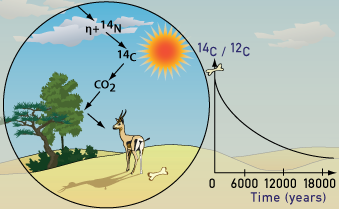 Animals and people eat plants and take in carbon-14 as well. The ratio of normal carbon (carbon-12) to carbon-14 in the air and in all living things at any given time is nearly constant. Maybe one in a trillion carbon atoms are carbon-14. The carbon-14 atoms are always decaying, but they are being replaced by new carbon-14 atoms at a constant rate. At this moment, your body has a certain percentage of carbon-14 atoms in it, and all living plants and animals have the same percentage. Plant-eating animals get their carbon-14 by eating plants. All animals in the food chain, including carnivores, get their carbon-14 indirectly from plant material, even if it is by eating animals which themselves eat plants. 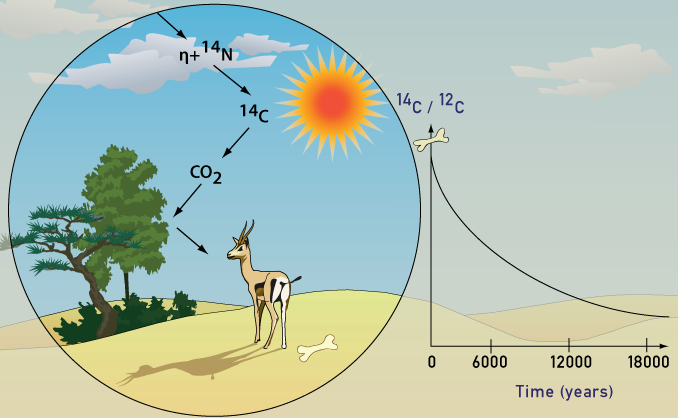 The net effect of this is that all living organisms have the same radiocarbon to stable carbon ratio as the atmosphere. As soon as a living organism dies, it stops taking in new carbon. The ratio of carbon-12 to carbon-14 at the moment of death is the same as every other living thing, but the carbon-14 decays and is not replaced. The carbon-14 decays with its half-life of 5,700 years, while the amount of carbon-12 remains constant in the sample. By looking at the ratio of carbon-12 to carbon-14 in the sample and comparing it to the ratio in a living organism, it is possible to determine the age of a formerly living thing fairly precisely. The ratio of isotope carbon-12 to carbon-14 in a sample must be determined in order to date the sample. This task can be done by accelerator mass spectrometry, which is performed in huge laboratories where the most striking component is the accelerator - a huge tank where isotopes are accelerated.